Lurking near the southern edge of trendy Chelsea in Manhattan, a Jamaican gem has been gaining steam. 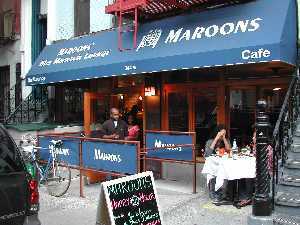 Opened nearly five years ago on a quiet street of 8th Avenue, Maroons has now tripled in size after expanding from its original space. The restaurant is owned by Mitchell, who grew up in Manchester (on the southern coast of Jamaica), and Arlene Weston, who is the executive chef and a descendent of the original Maroons. Her family came from Mandeville, also in Manchester, close to where the Maroons established their breakaway free community. The Maroons were escaped African slaves who fiercely defied all attempts to subdue them. Their namesake was derived from the Spanish word “Cimarron,” meaning ‘wild’ or ‘untamed’. They’ve contributed to the island’s rich cuisine, and are believed to have originated the ‘jerking’ technique that has become a world-renowned way of flavoring chicken and other meats. Gregor Altman is a longtime student and willing participant of explorations in exotic cultures and cuisines. He has gravitated to those which make use of hot spices and medicinal botanicals. Recent involvements include managing a natural food producer in New Mexico, and volunteering at a community supported agriculture (CSA) farm on Long Island, New York. He can be reached at gregornyc@earthlink.net.